There’s something about a solitary, lonesome black stratocaster, that makes me want to play Jimi Hendrix riffs. In the video above I created on original piece of music — a homage –that pays tribute to Jimi Hendrix’s guitar style. 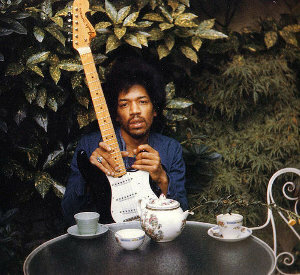 Specifically, his R&B guitar style from the likes of Little Wing, and Bold as Love. I took a basic Gospel C/F progression and just let my mind wander a landscape of Hendrix licks and phrases. In some cases the licks are verbatim, and others have my spin. I’m calling this tune, No Cross to Bear. I’ve suffered from anxiety my whole life — except when I play my guitars. Though I do a lot of film score stuff on classical/acoustic guitars — there’s something about a Strat that makes me lose sense of space and time. When I play my Strat, figuratively speaking, I have “no cross to bear”. My guitar is a Fender ‘ The Edge Strat’ straight into a Vox AC10. You can find all of my gear here. If you like this, check out my blues archive. I wrote a similar Hendrix influenced piece here. The guitar tab for No Cross to Bear is four pages long. There’s a lot here, so I deliberately spread the guitar tab out to make it easier to comprehend. I recommend this song for intermediate and experienced guitar players only. I use my thumb to fret the Low E string on all but the final major chord of the song. Enjoy, and good luck! The guitar tab is available below.